With large parts of the U.S. experiencing so much snow recently, this seemed like the perfect time to take a look at one of our trade catalogs about sleds. 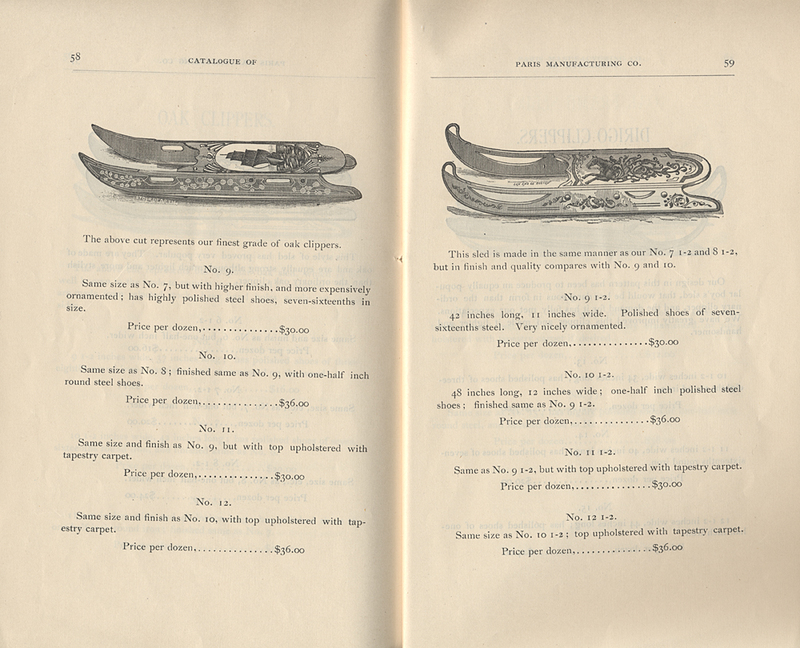 Catalogue of Paris Manufacturing Co. is from 1890 and shows several pages of sleds. Though these have a slightly different appearance than sleds of today, some of us might remember ones that looked similar to these. Paris Mfg. Co., South Paris, ME. Catalogue of Paris Manufacturing Co., 1890, pages 68-69, Girl steering a sled with Patent Steering Attachment and two boys riding a Boys’ Double Runner sled. 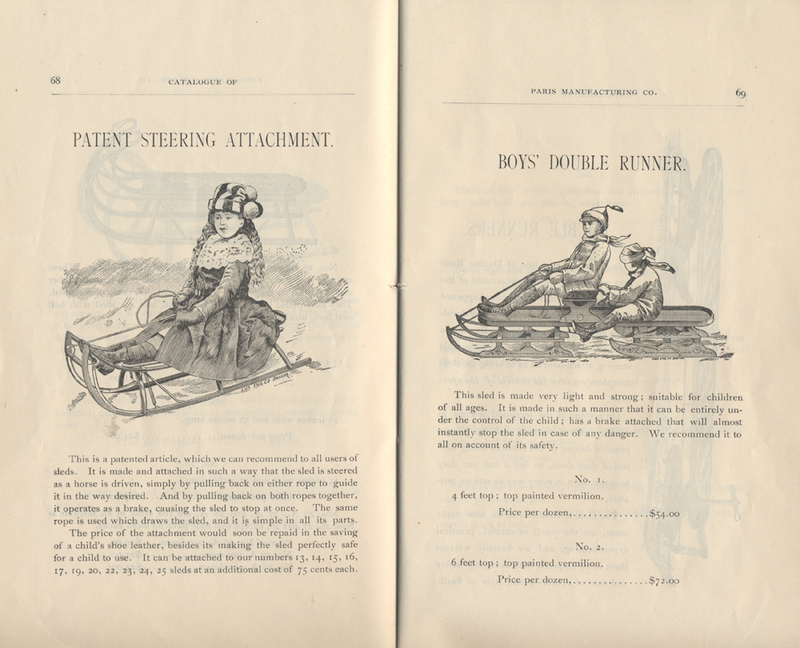 Also illustrated above, but on the left, is a girl using the Patent Steering Attachment to steer her sled. The idea was simple. The attachment allowed the sled to be “steered as a horse is driven.” Just pull back on the left or right rope to guide the sled in that direction. To stop it, pull back on both ropes at the same time. All the sleds described in this catalog are decorated in some way, some more elaborately than others. A few of the sleds, such as this one shown here on the right page, have swan necks. Some of the sleds have simple decorations, like this one here on the right page, which is decorated with a few flowers. But others, like these Oak Clippers pictured below, are decorated much more elaborately with images of a boat and horse. Paris Mfg. Co., South Paris, ME. Catalogue of Paris Manufacturing Co., 1890, pages 58-59, Oak Clipper sleds. Catalogue of Paris Manufacturing Co. is located in the Trade Literature Collection at the National Museum of American History Library. Want to see other images of sleds from 1890? Take a look at the Galaxy of Images for more sleds.